Designed and custom-made based on the depth of the cornice and the size of the heater. Automatic mover for GRADO infrared heaters. It can be equipped with heated bodies of any kind. Structure made with extruded aluminum bars, maximum strenght and minimum weight. Side brackets for the optimal fixing on any type of surface. 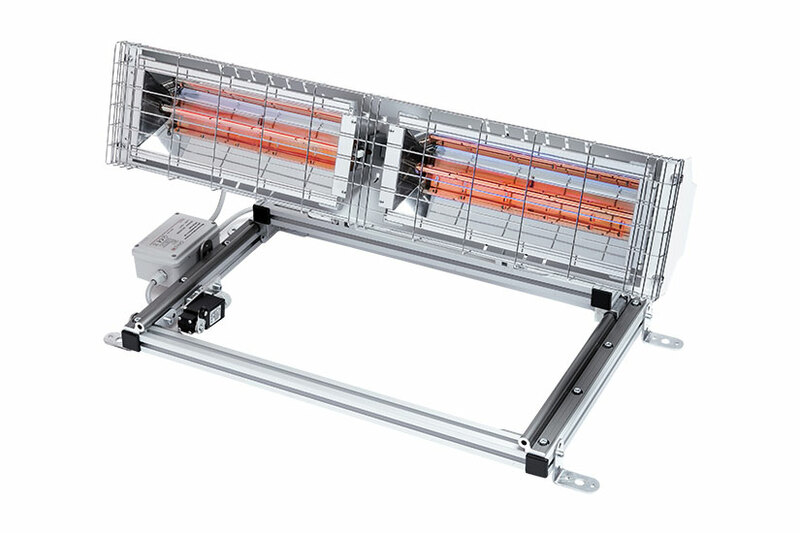 Linear guides with self-cleaning and self-lubricating runners. The fixing height of the heater is editable. Suitable for any type of GRADO heater, with single or double fixing bracket. Chain drive equipped with end-of-stroke adjustment and self-protection in the case of overheating. Limit switch for the power up and power down control of the lamp. Terminal box for connection with power supply and control signals. Designed for indoor use. Ideal for installation on cornices. Ideal product for concealed installation of the heaters in churches, museums, places of historical interest, monuments and all those environments in which it is necessary to make disappear/move back the heating bodies or lighting fixture.